I love baking desserts. If I could I would spend my entire day baking up a storm. I love the trial and error. The measuring. The combining of the right ingredients, its all just lovely to me….until its clean up time…and then I swear I will never bake again. So if you are anything like me, or you are not the greatest baker, but want to impress some guest, this is a great, simple no fail dessert that you can make. Beautiful wow factor with not a lot of mess…an easy to make and delicious dessert. 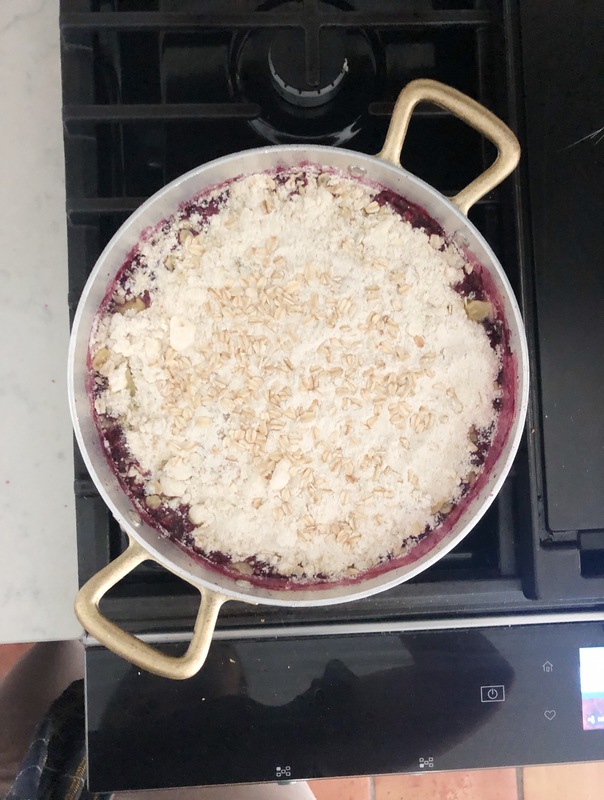 When I saw Jaime Oliver’s fruit crumble recipe -on his insta stories – and how he made 3 different types of fruits crumbles, I was all over that. BUT…I didn’t want to clean up a huge mess today; so I had just one rule…dirty the least amount of dishes as possible. For my first fruit crumble, I only used 1 pot to cook & bake everything! And that is the story behind this lovely fruit crumble. 1 pan, 1 bowl + 2 forks, 1 zester and 1 knife. That is all it took! I began using a pot that was oven safe and added frozen fruit to it. Frozen strawberries, frozen blueberries and frozen cranberries. I added lemon zest to the pan, for added flavor and the juice of that lemon as well. I added water to cover the bottom of the pan. About 1/2 a cup. Allow the fruit to zimmer and thicken. the reduction of the fruit in the water, will always make the fruit look darker. Once it cools of the fruit will become even more thicker. I used 1 stick of Irish butter and twice that amount of flour. So a 2 to 1 ratio. I used a fork to mix in the butter and flour. Until little pea sized balls formed. I added about 1 teaspoon of pure vanilla extract. About 1/3 of a cup of brown sugar. I also added about 1/4 of a cup of honey. Finally I added about 1/4 of granulated sugar & 1/2 a cup of oats of fashioned oats. I keep my crumble topping in the fridge, to keep the butter nice and cool while the fruit is reducing. Once your fruit is done reducing add the crumble. Bake in a 375 degree oven, until topping is browned! Delicious strawberry, cranberry & blueberry crumble! 2. turn on heat to medium high. 3. add 1/2 cup of water. 4.zest one lemon and add the juice of that lemon. Allow the mixture to simmer until the fruit has thickened & turned a slightly darker color. 5. add 1 cup of flour to a mixing bowl. 6. add cold butter & begin to mix the two until you get pea sized dough balls forming. 7. add the vanilla extract. 8. then add the brown sugar, white granulated sugar, the salt & the honey. 9. Finally at the old fashioned oats and mix it all together. Turn off the heat and place the topping mixture on top of the hot berry mixture. Place it all in a 375 degree oven for about 20 min or until golden brown.